On Friday afternoon around 12:30 p.m., the Student Government Organization, Student Budget Committee, and Sunrise Swarthmore gathered in Parrish Parlors to announce that they would be working together to invest unused money from student clubs into a fossil-free fund. This fund will be run by BlackRock, a large investment management firm with a commitment to long-term social and environmental sustainability. The event was attended by about 20 students and faculty members. It was moderated by Aru Shiney-Ajay ’20 and included a line up of speakers from SGO, SBC, and Sunrise Swarthmore who support this initiative. One of the speakers was Sunrise member Jissel Becerra Reyes ’20 who shared a personal story about how climate change affected her family during Hurricane Irma. “This anger is what drives me here today,” Becerra said. The event in Parrish was organized to coincide with a Board of Managers meeting taking place in Kohlberg Hall. September Porras Payea ’20, one of the leaders of Sunrise Swarthmore, describes the event as both a celebration and a reminder to the Board that divestment is still a priority for many students on campus. “We felt this event was especially necessary to both celebrate the action of SGO as a representative of the student body as well as to bring divestment back as a focus of our campaign,” Porras said. Sunrise Swarthmore leaders publicized the investment of student money from the Swarthmore Capital Expenditure account as a small victory for students advocating for divestment. In a press release, they explained how investing unused student activity fees into a fossil free fund is a win for the divestment campaign. 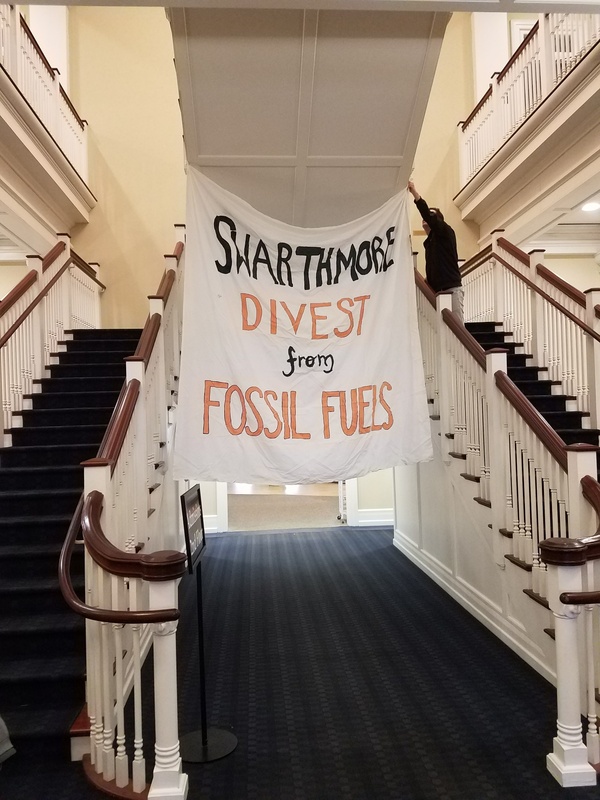 Sunrise Swarthmore’s most recent attempt to get the board to divest from fossil fuels occurred last spring, when they launched an SGO referendum for students to vote on a plan for partial divestment. The referendum demonstrated that, of the 880 students who voted, 80.5 percent of students supported divesting from fossil fuels. The Board of Managers and President Valerie Smith responded to the referendum by re-affirming the Board’s 2015 decision not to divest, citing the sustainability and investment policy. Nevertheless, Porras expressed Sunrise’s excitement for their collaboration with SGO and what the partnership means for the divestment movement on campus. “We are inspired by the passion of the student body when organizing events like these. The initiative taken by SGO to keep student funds fossil-free was exciting for us, and it has been amazing to create a strong partnership through both of our forces. Furthermore, discussions on campus, from classrooms to friends in Sharples, around divestment has been growing, and to be able to bring the fight back to campus has been an exciting moment for us,” she said. For SGO, the referendum is one reason why they are collaborating with Sunrise Swarthmore to invest student funds into a fossil-free account, as the referendum is seen as a representation of the student voice. They explained that this partnership with Sunrise Swarthmore aligns with one of their many new objectives for this spring. For example, SGO co-president Nancy Yuan ’19 cited how SGO also sees the investment into a divested fund as a method of eliminating the activities fee in the future. She asserted SGO’s role in advocating for students while also establishing a lasting impact on campus. Yuan explained how this fund works and why SGO supports the fund as a more fiscally responsible option. 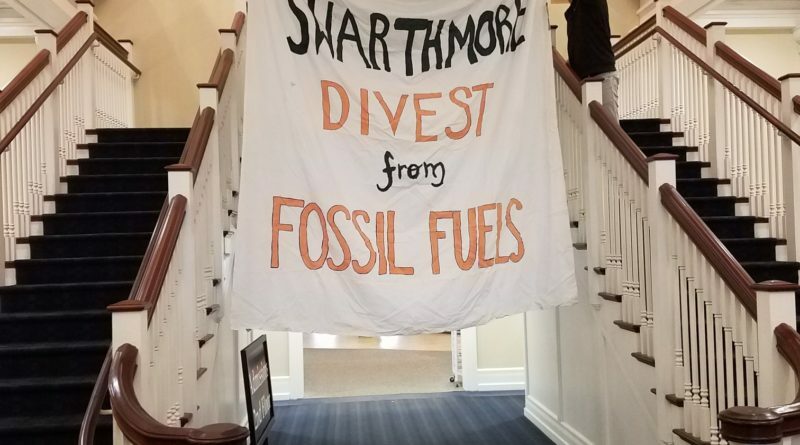 While the Board will not divest the endowment from fossil fuels, SGO and Sunrise are asserting a student approach to divestment; they are advocating for investing surplus student activity funds from the Swarthmore Capital Expenditure account into a fossil-free fund that three members of the Board of Managers established in 2015 with BlackRock, a socially-conscious investment fund. SGO hopes to use the returns from the fund to eliminate the activities fee for future students, which currently costs each student $398 per academic year. By investing in a fossil-free fund, SGO and Sunrise feel they are upholding both economic sensibility and social justice. Grant Brown ’21, another student from Sunrise Swarthmore, explained why investing the surplus student money in fossil free funds is necessary for upholding environmental justice. Yuan also mentioned the need to affirm social justice in our actions, explaining how investing in a fossil-free fund is one way of modeling this value. “Since BlackRock is one of the largest socially-conscious investment funds, it makes a lot of economic sense,” Yuan said. Ethan Chapman ’19 views the investment of student activity funds into a fossil-free account as a positive action taken by student organizations that demonstrates the interests of students to the Board. “I am happy to see school organizations acting responsibly for a change. All that really matters is convincing the Board to address its conflicting interests,” he said. As the semester continues, Swarthmore Sunrise and SGO plan to continue to collaborate on the BlackRock investment of student funds. Yet, both groups will also continue to further their individual missions as well. For Swarthmore Sunrise, this means further pressuring institutions and policy makers to reinvest in just solutions to the climate crisis. They hope to continue to organize around divestment while also engaging in political action off-campus to elect officials who are dedicated to fighting climate change. For SGO, this means carrying out the wishes of students, including strengthening their relationship with affinity groups and encouraging groups to use more of the activities budget through a SEPTA ticket program.